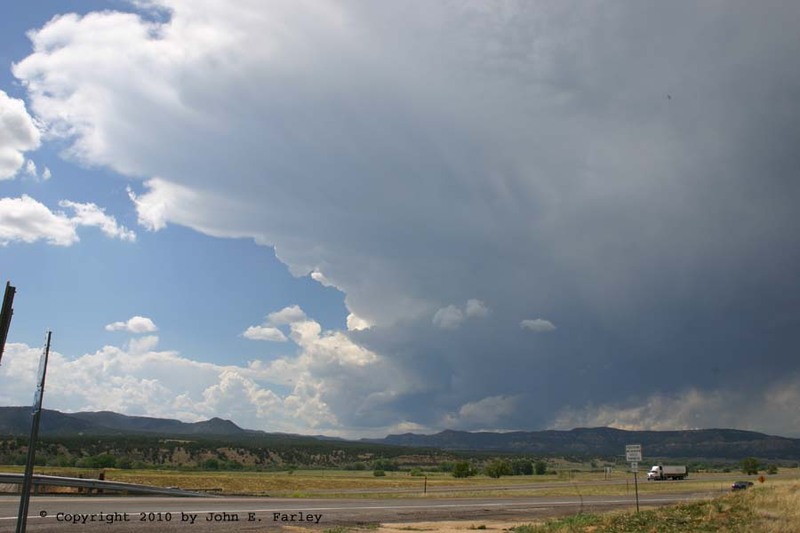 Very unstable air was moving into northeastern NM and eastern CO today, with upslope southeasterly flow on the east side of a back-door cold front that had moved in from the east and northeast and stalled in a north-south orientation along the mountains. 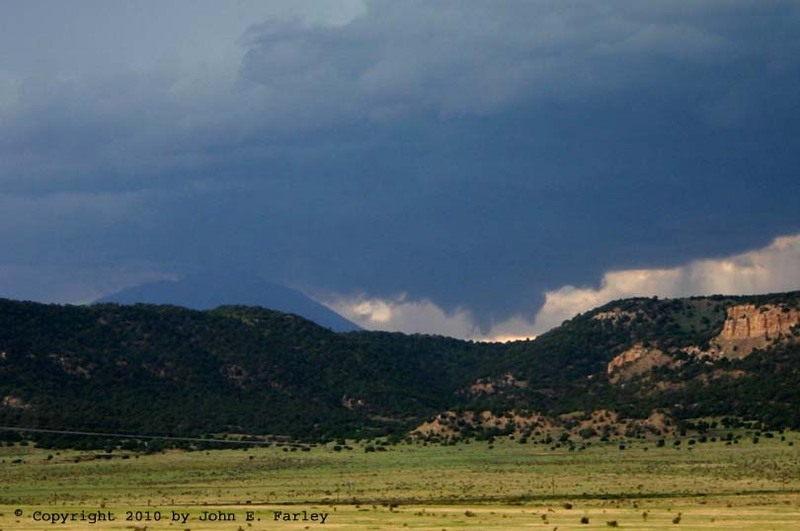 By early afternoon, CAPE was already in the 3000-4000 range over northeastern NM and southeastern CO. The wind profile was weak, but with good mid-level directional shear, just above the southeasterly low-level winds which extended from the surface (about the 850 mb level, at the high altitude just east of the mountains) up to 700 mb. This directional shear, though the wind fields were weak, combined with the very unstable air and the upslope flow, created a favorable setup for storms to form over the mountains and become supercellular as they moved over the plains in the weak WNW mid-level flow. Because the best directional shear was well above the ground, tornadoes were not likely, but supercells were. I figured that a supercell would likely develop somewhere near the NM-CO border, in the area from Raton and Trinidad eastward, perhaps over the Raton Mesa. 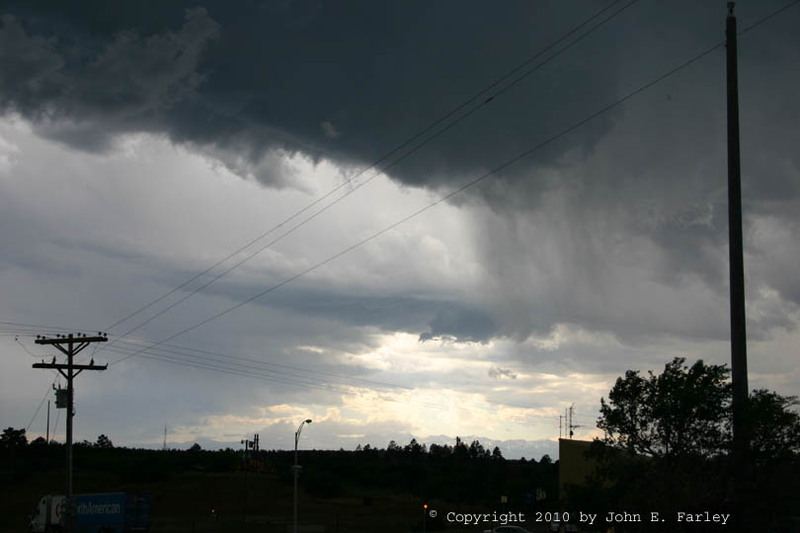 As it turned out, intense and at least briefly supercellular storms did develop over the mountains, but the mid-level wind fields were too weak to push them very far out over the plains. 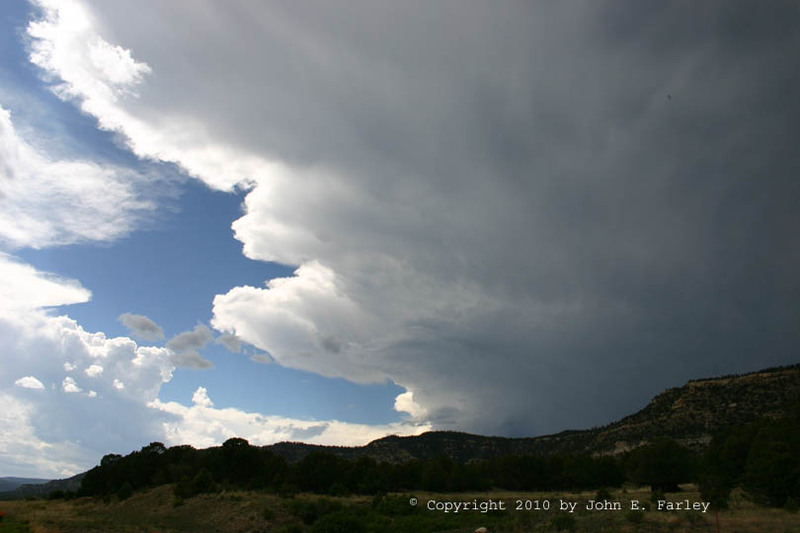 The only two clusters of storms that moved out onto the plains at all were the two that went severe, both initially over the mountains before moving out onto the plains, and even these did not move very far from the mountains. I headed out from Santa Fe in the late morning and noticed storms already under way in the mountains between Santa Fe and Las Vegas, NM. Since the storms were in the mountains and the better severe weather setup was farther north, I continued up I-25 to the Raton, NM area. Along the way, I made various stops to for lunch, gas, and looking at storms over the mountains, such as this one. Like some of the others, this one had decent-looking upper structure, but relatively little precipitation. I liked the knuckled anvil in this particular cell. 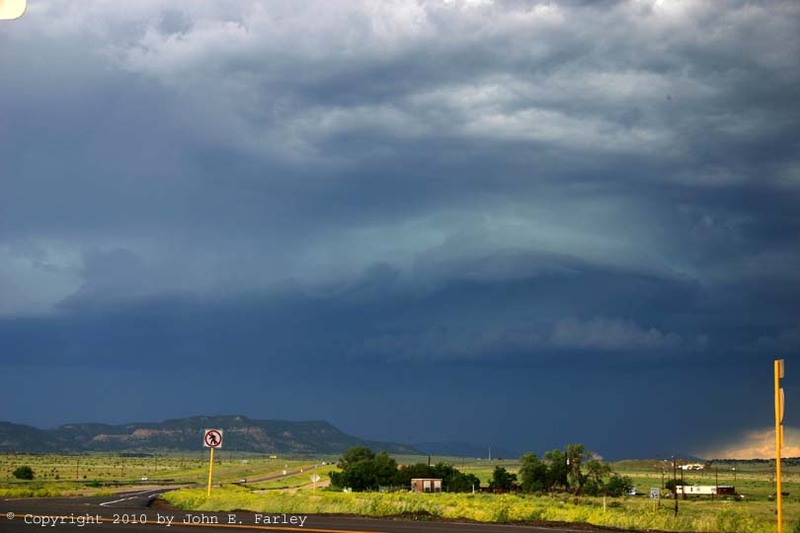 By the time I was getting into the Raton area around 3 or 3:30, a strong storm over the east slope of the mountains just north of the CO border northwest of Raton and southwest of Trinidad was getting my attention. 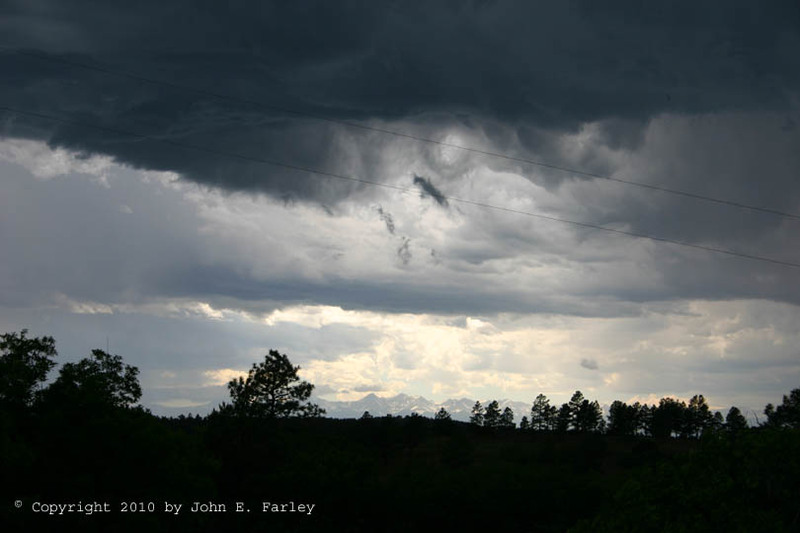 To its south was another, weaker storm southwest of Raton, also over the east slopes of the mountains. I decided to drive up a wide canyon that extends more or less west from Raton to try to get closer to these storms and hopefully get a better view of the northern one through a gap in the mountains. As I did, I noticed that the southern storm had formed a small beavertail. Based on what happened later up in Raton Pass, I think now that this was an anticyclonic left split from the initial southern storm. Meanwhile, what I could see of the northern storm still looked pretty good. But what I could see of it was not a lot, so I decided to head up into Raton Pass to see if I could get a better look. At the top of Raton Pass, I watched and realized that the storm that had had the beavertail was apparently a left split of the southern storm, as it had moved rather quickly toward my position, while the northern storm drifted only very slowly to the east-southeast. The two met roughly over my location, resulting in a new surge of precipitation, lightning, and thunder just to my west, which eventually moved over my location with big raindrops and a few minutes of small hail, generally 1/3 inch in diameter or less. 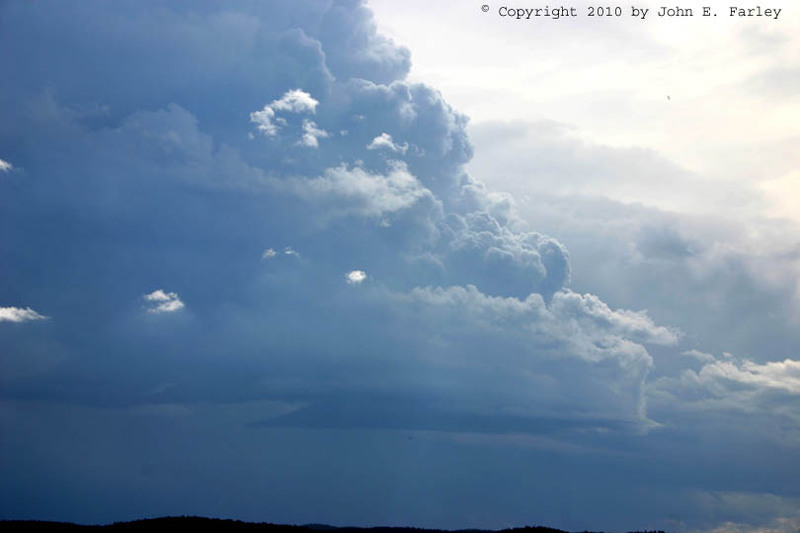 There was some interesting storm structure, like this and this as this process occurred. I think these were more likely scud fingers than funnels under the lowered area, but can't really say with any certainty. This was quite some distance away from me; perhaps 10 miles, so it was hard to tell. A minute or two after getting this picture, I managed to get about 30 seconds of video of this feature, but it had already become less organized. The video shows upward motion, but it is hard to tell about rotation, given the distance. I do think it is safe to say there was a wall cloud here, though. After getting these pictures, I continued north toward the storm past the Aguilar exit. However, the space between the splitting storms was now filling in, and this area was starting to surge toward the southeast, so I soon had to backtrack back to the Aguilar exit. There, I got this picture of the surging storm and these video captures of one of the many flashes of CG lightning, as well as the step leaders that preceded it. 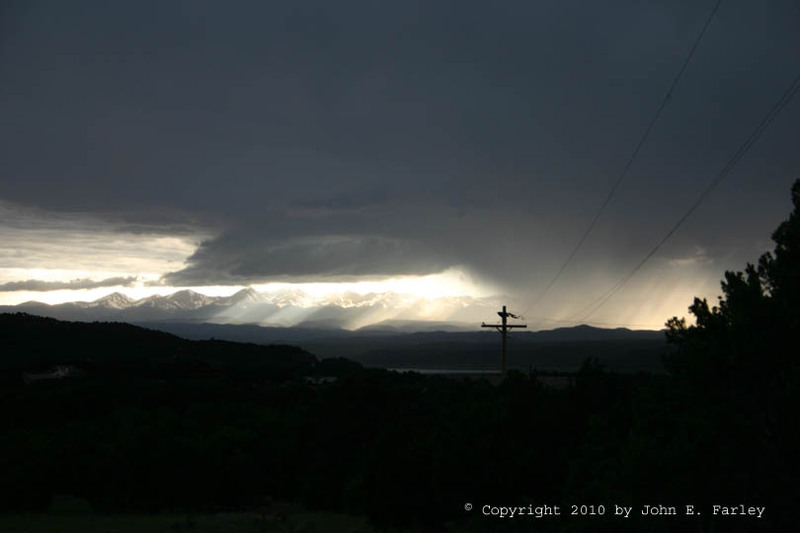 By now, though, the storms were weakening, so I knew it was time to head back to Santa Fe. I got a nice sunset view with some cumulus and a weak storm along the way. 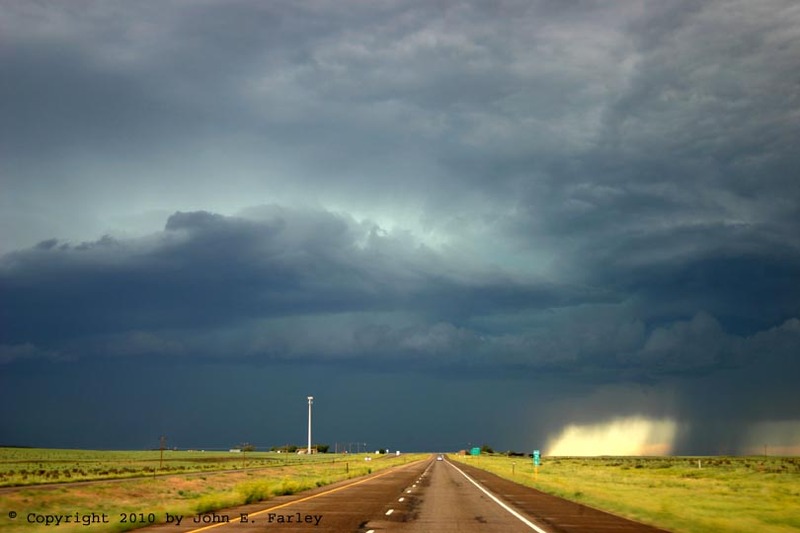 At this time, it appeared that all of the storms were weakening or dying out, though a few were still left in the southern Sangre de Cristo Mountains in the area between Santa Fe, Taos, and Las Vegas. With the storms weakening, I expected an uneventful drive back to Santa Fe. However, that was not quite to be the case. 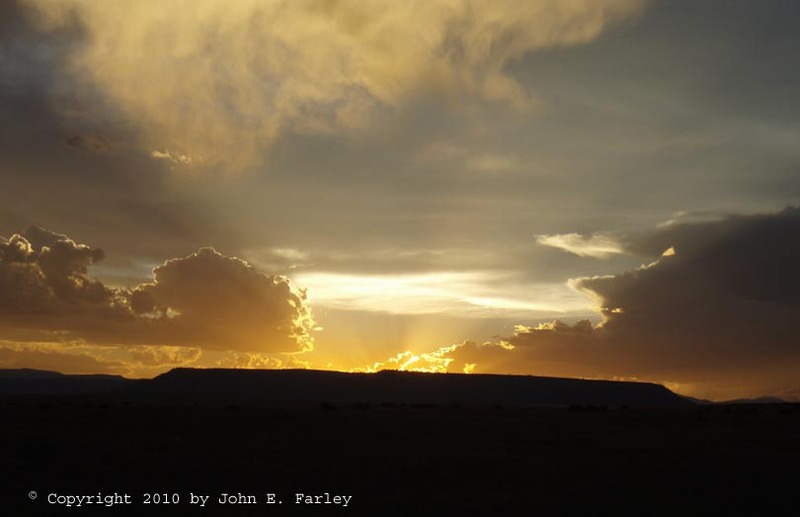 By the time I had passed Las Vegas, NM, I noticed a considerable increase in the lightning over the mountains, and the storms appeared to form a (perhaps-broken) line from somewhere down near Albuquerque to somewhere northwest of Las Vegas. Soon the lightning was near continuous, and it was evident I would need to cross through the line of storms. I did not have radar by now, because, when it earlier appeared the storms were dying out, I had disconnected and shut down the computer. Not sure I could have gotten a signal anyway. 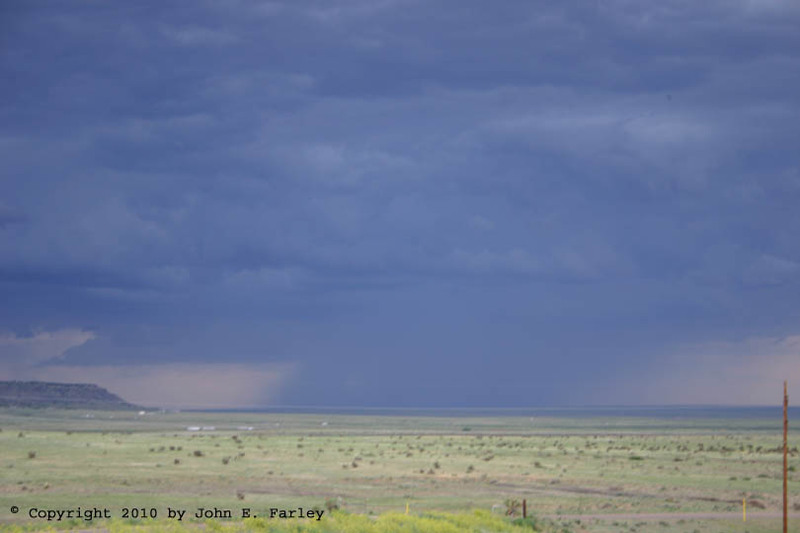 But by the time I was nearing the Pecos/Rowe exit, I could see an intense wall of precipitation ahead, illuminated by the frequent lighting. I was also driving in strong wind, with occasional clouds of dust being kicked up. Just before the exit, I was hit by an intense barrage of rain and hail, so I bailed off at the exit. The intense precipitation was blinding, and I could hardly see where I was going, but I knew there was an underpass where route 63 passed under I-25 at the north edge of Rowe. After a couple minutes I found it, and along with a few others took shelter from the hail under I-25 on the shoulder of route 63. The intense barrage of small (1/4-1/2 inch) hail continued for about 5 minutes and pretty much completely covered the road for a brief time. I got out of the car under the overpass and got some video. Would have gotten more if I had not had to dig out the video camera, which I had stashed in my tote when I had thought the chase was over. When the hail had stopped for a couple minutes, I started out, but it began to hail again, a little larger this time, so after turning around I got back under the overpass on the opposite shoulder. Again I got out and got video. The hail paused briefly, then resumed, but not as heavily as in the initial 5-minute barrage. However, the hail this time was a little larger, as noted above, with a few dime to penny sized stones. The video in the clip below is from the second wave of hail. After a couple minutes that stopped, and I proceeded on toward Santa Fe on I-25. A couple miles past the exit, I encountered an inch of so of hail accumulated on I-25, more than was left by then in the area where I had taken shelter. In the same general area, I also encountered one brief but very strong burst of wind. 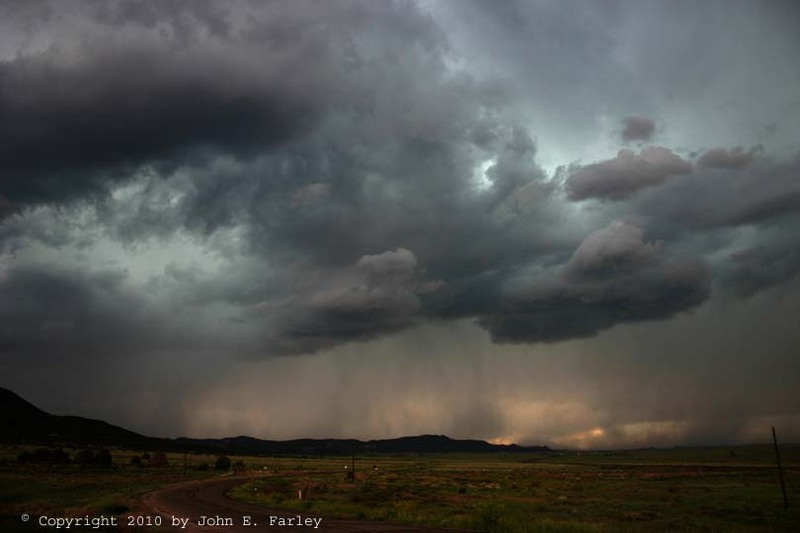 Around the time the hail began, the ABQ NWS had issued a significant weather advisory for the storm. Shortly after I got back on I-24, this was followed by a SVR warning for hail up to half-dollar sized and 60 mph wind, and the storm remained SVR warned for a couple hours as it surged southeast onto the plains, toward the Santa Rosa area. I feel pretty good about this day's chase, as I managed to get on the only two clusters of severe storms that developed in the severe thunderstorm watch that was issued for southeast Colorado and northeast New Mexico from 6:05 p.m. to 1:00 a.m. Perhaps it is no coincidence that these were also the only storms that moved off the mountains and out onto the plains. 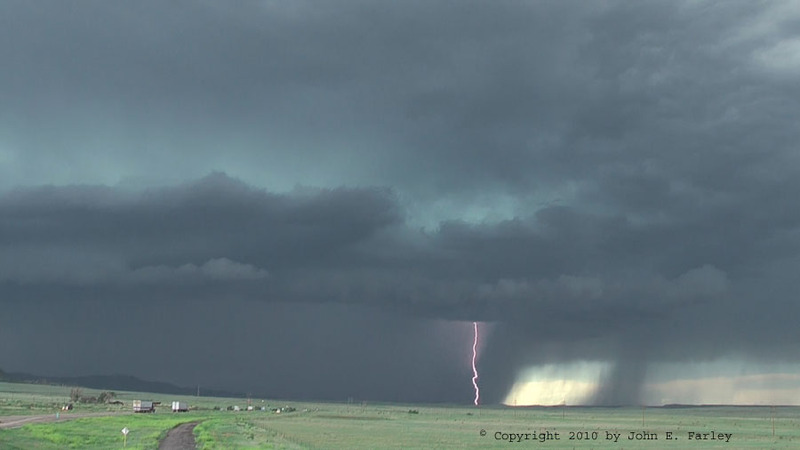 I might also add that it was my first time chasing in Colorado; I'll be back! The hail in the video above is from the second of the two waves of hail, which was slightly larger than in the first one, but not as much hail. Total chase distance: 477 miles.